This article is really more about a feature you can use to create background services to run tasks asynchronously inside your application. This fifth part of this series doesn't really show a customization. This part is more about a feature you can use to create background services to run tasks asynchronously inside your application. Actually, I use this feature to regularly fetch data from a remote service in a small ASP.NET Core application. 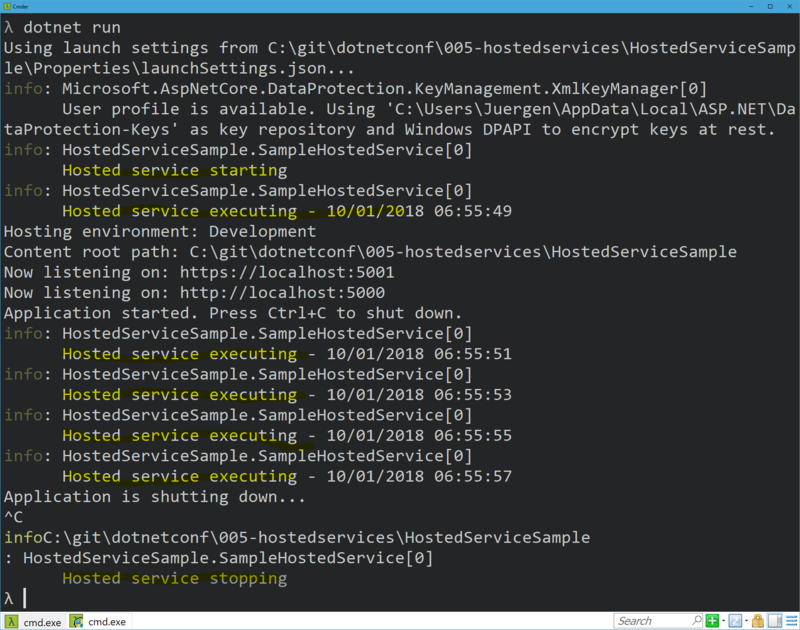 HostedServices are a new thing in ASP.NET Core 2.0 and can be used to run tasks asynchronously in the background of your application. This can be used to fetch data periodically, do some calculations in the background, or perform some cleanups. This can also be used to send preconfigured emails or whatever you need to do in the background. HostedServices are basically simple classes, which implements the IHostedService interface. A HostedService needs tom implement a StartAsync() and a StopAsync() method. The StartAsync() is the place where you implement the logic to execute. This method gets executed once immediately after the application starts. The method StopAsync(),on the other hand, gets executed just before the application stops. This also means that to start a kind of scheduled service you need to implement it on your own. You will need to implement a loop which executes the code regularly. As you can see, the log output is written to the console every two seconds. You can now start to do some more complex things with HostedServices. Be careful with the hosted service, because it runs all in the same application. Don't use too much CPU or memory, this could slow down your application. For bigger applications, I would suggest moving such tasks to a separate application that is specialized to execute background tasks. A separate Docker container, a BackroundWorker on Azure, Azure Functions, or something like this. However, it should be separated from the main application in that case. In the next part of this series, I'm going to write about MiddleWares and how you can use them to implement special logic to the request pipeline, or how you are able to serve specific logic on different paths.